The Objet Connex 500 is a polyjet 3D printer that works by spraying tiny droplets of liquid resin, which are rolled flat and cured with UV light. The Connex 500 prints at an extremely high resolution and can print in multiple materials at once, making it capable of creating much more accurate and complex parts than most other 3D printers on the market today. 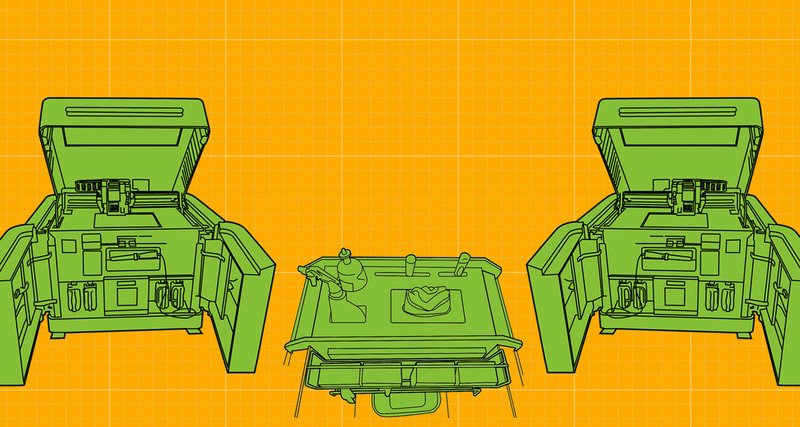 For a deeper dive into the process of 3D printing from scans and 3D modeled parts check out the all the free Instructables 3D printing Classes. An overview of the basic operations of the Objet, including safety, approved materials, and tips for successful use. Learn the qualities of the different resins available for printing on the Objet and understand digital materials. To keep Objets printing successful accurate parts, it is essential to clean the print heads after every job. Objet prints come off the machine with a support material. Learn the best methods for removing this material from your print.